Think back to the heady, carefree days of childhood for a second. Now, anyone will tell you not all days were coloured by idyllic splendour and unfettered enthusiasm, but there were enough of them for most of us to recall the sheer joy of discovering something new and exciting that wasn’t just fun but had the capacity to fundamentally alter our lives. Adults, of course, treat these kinds of epiphanies, rare as they are as you get older, with a (mostly; let’s face it, maturity is not universal nor constant) sage understanding of their implications and consequences but kids? Ah kids, grasp them enthusiastically with both hands, test them out, make mistakes, fall, rise, and see where it takes them. 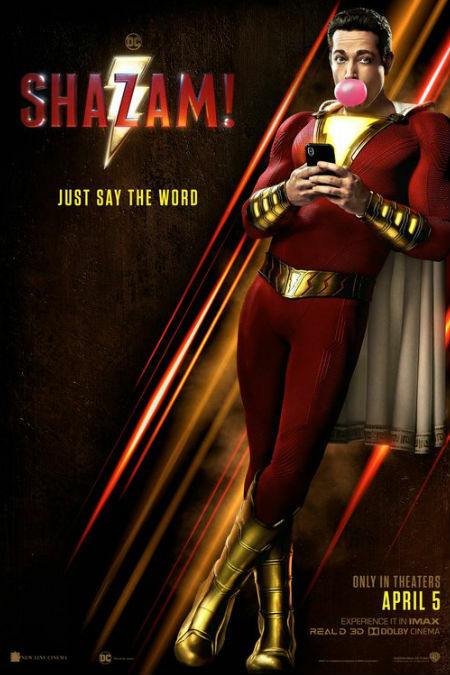 It’s that kind of immature (in the best possible way) exploration of new things that suffuses the giddy gloriousness of SHAZAM!, a film so replete with childlike glee and wonder, and so stoked about what it might all mean, that it really deserves multiple exclamation marks, preferably in batches of ten or twenty. Our eventually-excitable protagonist is Billy Baston (Asher Angel as a teenager, Zachary Levi as SHAZAM! ), a foster kid who it is revealed lost his mum at a winter fairground carnival as a kid, was never reunited with her and consequentially has spent the years since in a revolving door of foster homes. He’s not a bad kid so much as one lost and adrift, convinced that finding his mother, whom he is sure is still very much alive, will find the great big family-shaped void at the core of his being. After another ill-judged run-in with the Philadelphia Police, all in aid of using their database to track records of his mum, he is placed in a group home, run by former foster kids and quite possibly the world’s best foster parents ever, Victor and Rosa Vasquez (Cooper Andrews and Marta Milans respectively) whose brood of kids are exactly the family Billy needs. He just can’t see that yet. It’s not until the world’s oddest subway takes Billy to a mysterious cave beyond our natural realms, where lives a wizard named Shazam (Djimon Hounsou), an ancient, glowing-staff wizard who is the last of his kind and in need of a new “champion”, Billy being the obvious candidate apparently, that Billy begins to appreciate that everything he has ever wanted is to be found in the misfits-come-together environs of his new home. 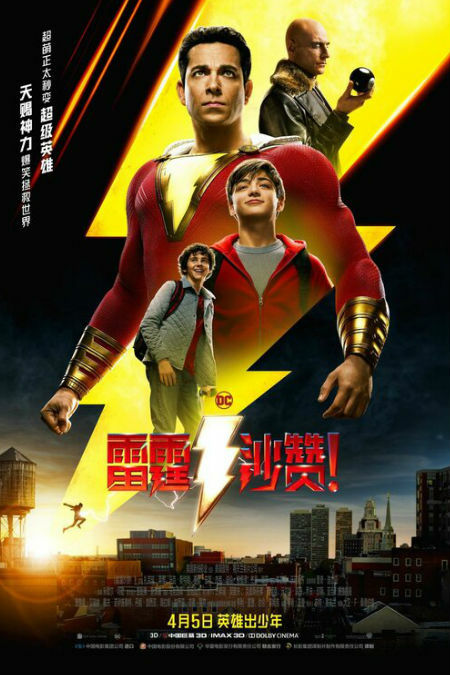 To begin with he’s forced to get the help of his family, especially nerdy, disabled Freddy (Jack Dylan Grazer), a superhero obsessive who is the only who will believe that the strapping musclebound man in red lycra with a glowing lightning symbol on his chest is, in fact, his reluctant new foster brother Billy. Billy aka SHAZAM literally has nowhere else to go, transformed by magic into a Big-like adult – in many, wholly non-derivative ways, SHAZAM! shares a great deal of cinematic DNA with the Tom Hanks classic, from a fight scene which takes place in a toy store with a glowing giant piano on the floor through to Levi’s pitch-perfect little-boy-lost-in-a-grown-mans-body emoting, and beyond – in ways he can’t understand, imbued with powers he doesn’t know how to wield and with an enemy in demon-possessed Dr Thaddeus Sivana (Mark Strong) who may be weaker in strength than Shazam but has more adult smarts. Billy clearly needs help, not that Freddy, awestruck by Billy’s transformation, initially does much more than goof around with his new powerful pal, testing his powers in some pretty amusing and wholly teenager-like ways, buying beer and junk food, and coercing ATMs via lightning strikes from Shazam’s hands into giving them the money to buy every electronic product they’ve ever wanted. Yeah, it’s not so much saving the world as saving themselves to begin with, but in a storyline that is smart, funny and nuanced in a way most superhero films never quite manage, they both grow up through all the kinds of dumb mistakes we all make growing up, only this time with the added weight that their actions could have some pretty consequences, none of which they fully appreciate until an accidental zapping by Shazam’s lightning hands of a bus create a pretty scary situation for themselves and a whole lot of passengers. Where SHAZAM! truly excels is in the way it grapples with some pretty big messages while never losing its sense of heady, gee whiz what a thrill ride fun. 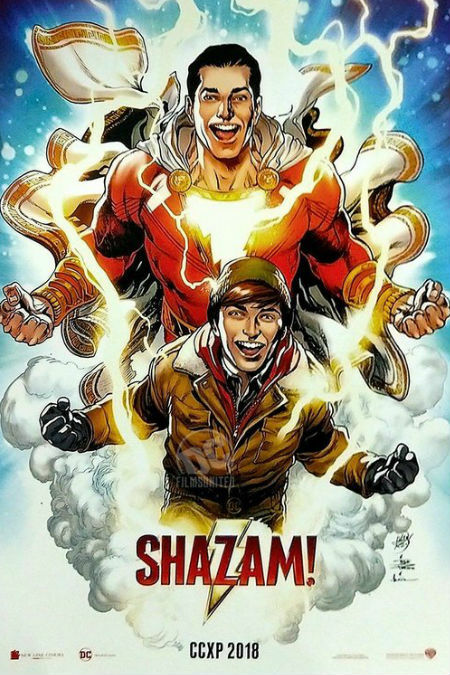 Billy feels lost and alone, and so does grown-up Thad Sivona and through ways big and impressively intimate, SHAZAM! neatly examines two entirely different responses to that need. It’s not obvious or forced, something in common with just everything the film sets out to say; at every pleasing step, the script by Henry Gayden is carefully-judged, subtle (quite the feat in a film where not a lot else is subtle, even the title), gets the message across without being hamfisted or clumsy, putting the humanity front and centre in ways that entirely authentic, and letting it breathe and grow in such a way that Billy’s character growth through the film feels natural. It’s all the more amazing when you consider the film’s premise which is stuffed to the mythical ceiling with wizards, magic, demons, transformed lives, destiny, fate, a grab bag of fantasy/superhero storytelling elements which are usually inimical to any kind of subtley. But SHAZAM! holds the epically out-there and the intimately in-there in perfect, exuberant balance, giving us a character in Billy/Shazam who makes perfect sense, who feels like a young teenager finding his way finally in the world, albeit by utterly extraordinary means, and whose fate matters. Powered by some pinpoint bang-on humour – his sister Darla (Faithe Herman) tells Santa in the middle of an epic fight scene that she’s been very good all year; its really not the time but Billy’s new sister, who is earnest and delightfully garrulous, gets away with it – silliness, and heartfelt sincerity that never feels cloying but honest and age-appropriate, SHAZAM! is a rare gem, a superhero film that deliver action and spectacle but never once forgets the humanity beneath it all, and particularly, how the getting of that matured humanity can be a messy business for all concerned, not least when you’re trying to be a grown-up superhero and a kid all at the same time.